I am pretty fickle and uneasy when it comes to trying new ingredients. One one hand, I am curious and challenged by the new approach but on the other hand, I tend to stick to my ways and am a creature of habit. That is why I usually create classic flavors and rarely stray to unusual pairings. However, I have been eying pomegranate molasses for some time now and finally just dove in a bought a bottle. Pomegranate molasses is a very thick pomegranate syrup that is more on the tart side. You can usually find a bottle at a Middle Eastern market, which is what I did. I have heard it being used as a marinade for meats and chicken and used in salad dressings, which all sound delicious. I have been on a veggie kick lately and wanted to use up the rest of these gorgeous rainbow carrots I had. 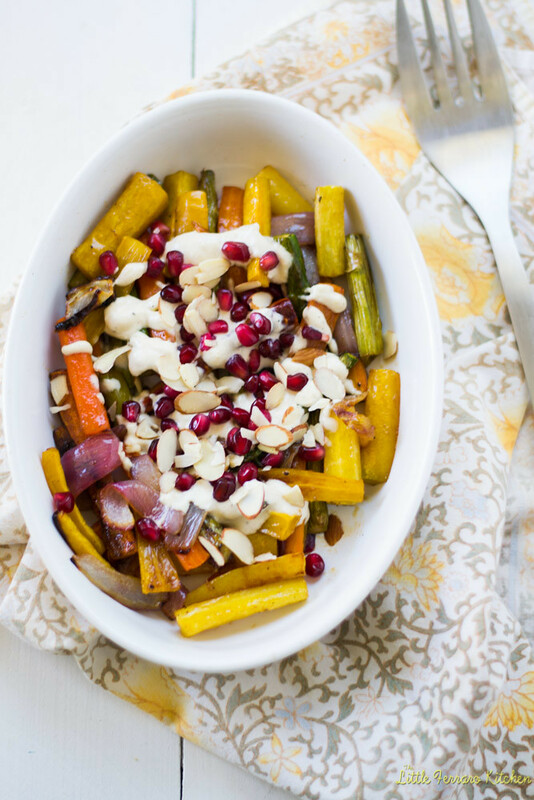 I also had 1/4 of a red onion and a few asparagus spears, so what better way to use them than in a gorgeous and rustic roasted vegetable dish. This was ridiculously easy really. All I did was roast my veggies with the usual olive oil, salt and pepper and then as soon as they got out of the hot oven, I tossed them with a mixture of the molasses and honey (to counter the bitterness). The warm veggies soaked up the molasses and every bite was a sweet smile. I didn’t stop there and also added a bit of contrast with a quick tahini sauce and sprinkled some pomegranate seeds and slivered almonds. One thing I would change next time is to make the tahini sauce a tad “thinner” to make it more of a drizzly consistency. But honestly, it was just amazing. 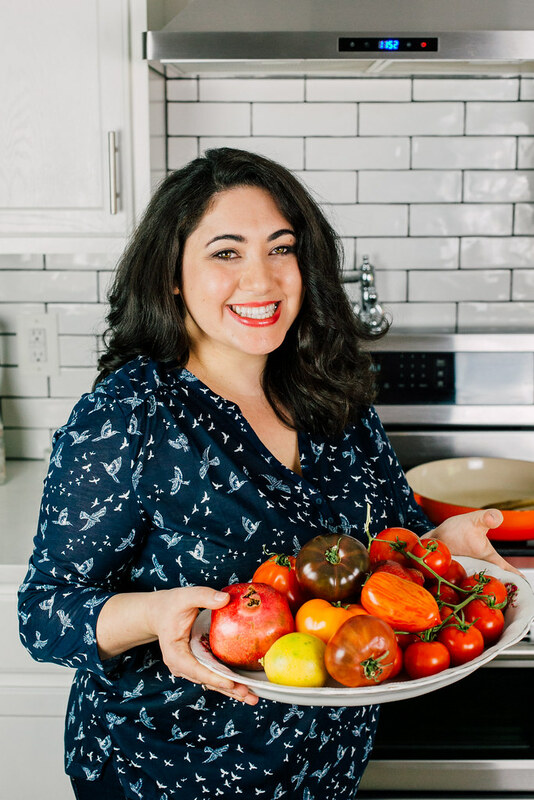 And I know pomegranate seeds aren’t in season right now, but my local Trader Joes carries a small container of them for just a few bucks and it is such an awesome addition. I also think this side dish would be fabulous for upcoming Passover and any Holiday table really. Lay vegetable son a foil lined baking sheet and drizzle with olive oil, salt and pepper. Toss to combine and roast in the oven at 400 degrees F for about 20 minutes, or until vegetables begin to tenderize. While veggies are cooking, mix pomegranate molasses and honey in a small bowl and set aside. Make the tahini sauce by combining everything in a food processor except the water. Pulse everything to combine and see how thin or thick your sauce is. If you want it thinner, slowly add water until your desired consistency. Taste for seasoning. 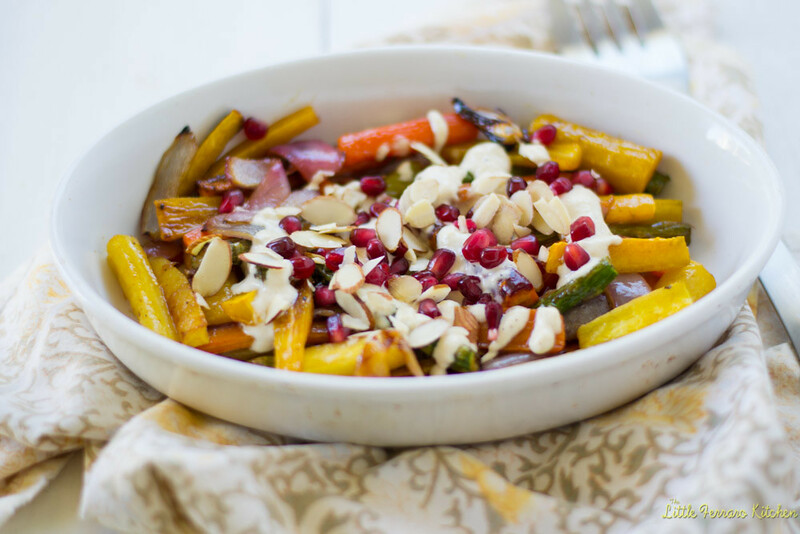 When vegetables are done, remove from oven and gently toss the pomegranate and honey sauce all over the vegetables, coating everything. 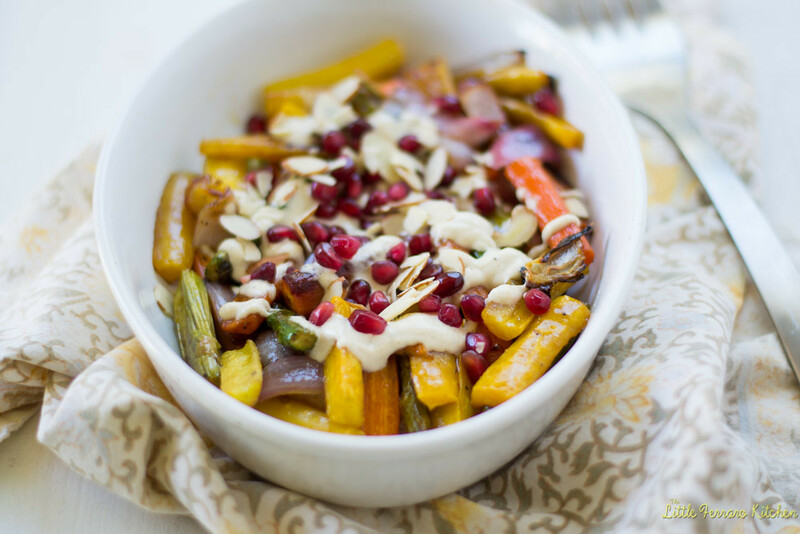 Transfer vegetables to a serving dish and drizzle with tahini sauce and top with almonds and pomegranate seeds. This is a very versatile recipe, use whatever vegetables you have on hand and adjust dressing as needed. Sounds fantastic, I’ve been eyeing pomegranate molasses for a while now, looks like it’s supposed to be good in salad dressing as well.